It's that time of year. The time when people are decking their halls and gathering together to celebrate whichever Holiday they choose to celebrate. In my house, there is always a tree. Christmas trees are beautiful, traditional, and make the house smell like you're walking in the woods on a snowy Christmas morning. When you combine that wonderful scent with the scent of Holiday cooking, you get a comfortably Christmas-y scent that everyone loves. One of my favorite spices to help bring more of that Christmas tree scent into the season (though I do use it year round) is Juniper. Juniper Berries are actually not berries at all. They are the female seed cones of Juniperus communis, a conifer (cone bearing plants) commonly known as the Common Juniper. This shrub has the largest range of any woody plant and can be found in most places in the northern hemisphere. In many parts of it's natural habitat, Juniper will only grow close to the ground, but it can easily reach 15 ft tall and there are even a few variants that have been known to reach 50 ft. This tree is extremely amiable to a number of different growing conditions, which probably is why it's one of the most popular conifers used in traditional Bonsai art. I will admit that I am one of those “weird people” who loves to drink gin. Most people I've encountered just don't get it. And when I describe gin as “Christmas tree in a bottle” they get super confused. But I LOVE the fresh flavor, and it's all thanks to Juniper. Not only is Juniper used to flavor gin, but it's also a common spice in traditional German food, as well as an amazing herb to use for quite a long list of health benefits. If you talk to culinary experts, they'll tell you that Juniper is great to flavor meat and to use in sauces. I tend use Juniper berries in a lot of foods and drinks that I make during this time of year. Wassail, mulled wine, and my homemade cranberry sauce, are just a few of my favorite recipes that use Juniper Berries. Parts Used- Commonly, the dried and ripe berries but sometimes the needles and wood have been used for medical purposes. Essential oils are often made using a combination of needles, wood, and powdered berries. Summary of Actions- Antiseptic, sudorific, antirheumatic, depurative, antispasmodic, stimulating, stomachic, astringent, carminative, diuretic, rubefacient, vulnerary, and a tonic. Traditional Chinese Medicine (TCM)- Known as Du Song Zi, Juniper has quite a number of uses in TCM. It's bitter and pungent and works primarily on the heart, spleen, and lung meridians. It's also known to promote digestion, warm the middle, expel phelgm, warm the lungs, and cleanses both the kidney and liver. Ayurveda- Juniper has several names in Ayurveda; Hapusha, Matsyagandha, Aaraar, Abhal, and Haubera. Juniper is recommended for pacifying both kapha and vata doshas, and for enhancing pitta dosha to aid metabolic functions. Essential Oil- Juniper essential oil is a well known antiseptic, used in the past to treat wounds, and even to sanitize medical equipment. Makes an excellent choice for deodorants and deodorizing sprays. When diffused it helps to sanitize and cleanse the air. It is also calming and stress relieving without sedating. There are some studies that even recommend this oil over medication for certain insomnia patients. It's also a gentile stimulant, helping to overcome fatigue, dizziness, and even depression. Joint Pain- Juniper helps to increase blood circulation, remove toxins, and reduce swelling, all of which help ease join pain caused by gout, arthritis, or rheumatism. Skin Conditions- This herb is amazing at helping treat skin conditions. In fact, it's one of the most common uses today. It helps speed up your body's natural healing process, helping to reduce the appearance of scars, sooth rashes, and helps reduce the inflammation that leads to outbreaks of eczema and psoriasis. Some studies are actually pointing to Juniper helping treat certain cases of vitiligo, a condition that causes patches of skin to loose pigmentation. Antibacterial and Antiviral- Juniper is a great herb for use in your household cleaning products. It works to kill most of the common bacteria, fungi, and viruses you find in your home. It also is effective against Staphylococcus aureus (Staph) , even against the antibiotic resistant strains of Staph and other resistant bacteria. Heart Health- Juniper helps to reduce high blood pressure, helps to lower high triglycerides, and acts as a tonic for the circulatory system. It also helps to cleanse blood of toxins like uric acid, heavy metals, pollutants, and excess hormones. Digestive Issues- Often used as a bitter herb, to aid the production of bile and ease digestion, Juniper is also excellent for quite a few other digestive issues. It's a carminative, helping to relieve flatulence and bloating. It's also a stomachic, helping to speed the healing of ulcers and helps prevent their formation. 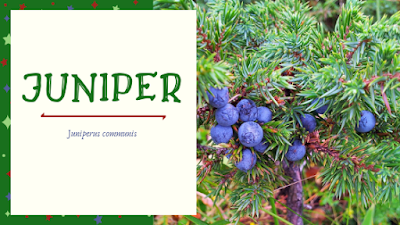 Diabetes- Ingested, Juniper has high amounts of natural insulin, which helps lower blood sugar. It also works to benefit the pancreas, helping to strengthen it as long as no permanent damage has been done already. Urinary Tract and Kidneys- This is the major action of Juniper. It's a great diuretic, helping to cleanse the body of excessive toxins. It's also been known as an effective remedy for kidney and urinary tract infections, kidney stones, and quite a few other kidney and urinary tract related issues. Contraindications and Warnings- Avoid use if you are pregnant, nursing, or trying to get pregnant. Check first with your doctor if you are suffering with kidney problems. Topical use of juniper can cause skin irritation, burning, redness, or swelling in certain people. Some individuals experience stomach and intestinal irritation after ingesting juniper. Juniper interacts with diabetic medications as well as medical diuretics so talk to your doctor if you are on any of those. Individuals should stop taking juniper at least two weeks before a scheduled surgery to prevent blood sugar concerns. I only included a basic introduction to this amazing herb. I hope you have learned a new appreciation for this lovely conifer. If you have any questions or comments, please leave them below.